Entry by ChocoMouse on Sun Jun 16 19:45:42 2013. Guys don't blame Hinata... if you want to blame someone blame Enoshima. She's the one who started everything. This is too much just looking at it almost made me cry ;A;/ why!? @Lorie19 I can appreciate that. After all, I highly doubt she would be one of those who would blame him. For some reason, when I see this picture, I keep hearing the chorus of Tears Don't Fall in my head. "Her conscience calls... the guilty to come home..."
Umm, actually it is Hinata's fault, you know. Even though, he's one of my fav chara, it is because of him that the killing started. Izuru may be the one who released the virus, but this was something all of them agreed to. 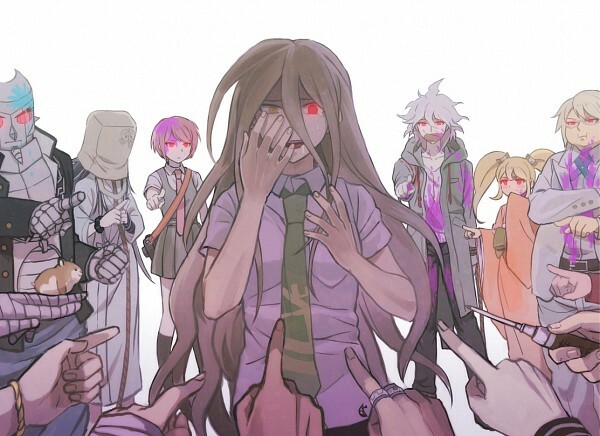 Moreover, as members of Despair, they were all killers.